UltraLite mk3 Hybrid, USB audio interface from MOTU in the UltraLite series. 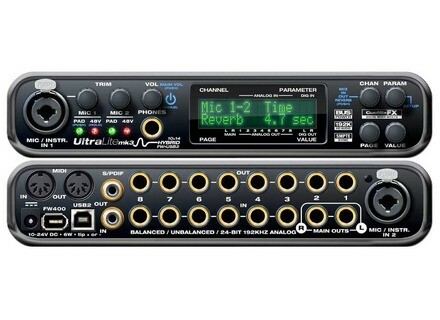 The UltraLite MK3 Hybrid is a 10 input and 14 output interface that connects to your computer through a USB cable or you can connect it to you computer through a firewire port if you PC or Mac has one. It has 2 very good preamps and has some on unit effects as well. The price is very affordable for all that this interface comes with. The UltraLite MK3 has a screen display on it, it is not a full color screen though. The screen display is great for choosing your effects and tweaking those effects to the desired amount you wish to use. You can use this interface with either a Mac or a PC depending on which OS you are using. You will get very low latency recordings with this interface and you can also use it for the effects in a standalone mode. I have used this interface for both recording and for effects, the first time that I used it was last fall. I wanted to purchase it immediately after using it for the first time. It is simple to set up, and you can use it in almost any DAW that you choose. Both of the microphone amps have phantom power built in for your condenser microphones. You will have no issues installing the drivers on your computer, it is a plug and play type of interface. The MK3 is also built to last you a long time, it is built with some sort of a protective casting around it that will stand up strong if you happen to knock it off the desk or drop it. Because it can not be racked this is something to take into consideration when looking for an interface. The MK3 has about 12 digital mixer effects that you have right at your finger tips. Even if you choose to not use this as your main interface you will still have some great effects that you can use stand alone.